1. Make the stuffing first. Add a tablespoon of canola oil to a large skillet that is preheating over medium heat. Add the chopped bacon. Begin to render the fat and cook until the bacon just begins to brown, about 4 minutes. 2. Add the shallots and cook for 3 minutes, stirring often. Add the kale and toss to combine. Cook until the kale just begins to wilt. About 2 minutes. 3. Add breadcrmbs and 3 tablespoons of chicken stock. Stir to combine. Cook for another 3-5 minutes, remove from heat. Take stuffing out of pan and set aside. 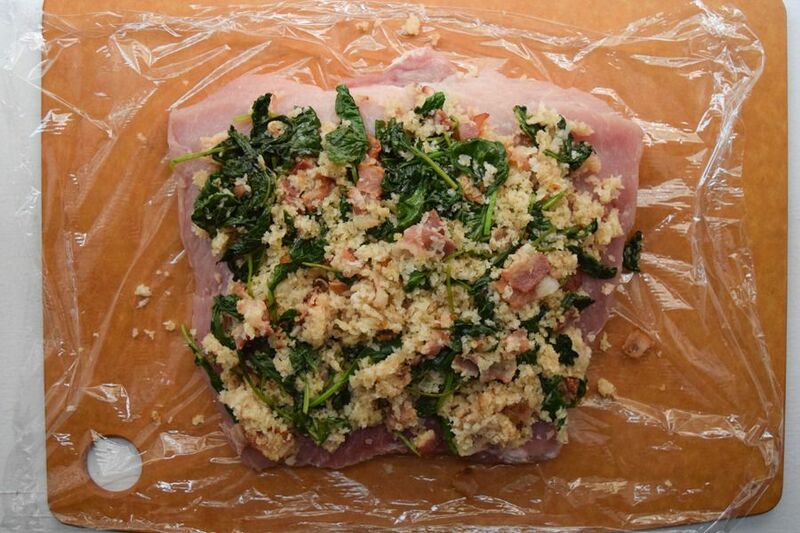 4.While the stuffing cools, start preparing the pork. To butterfly the pork, run your knife across the roast lengthwise, slicing until you have almost reached the bottom but don’t cut through. Open the pork like a book. 5. 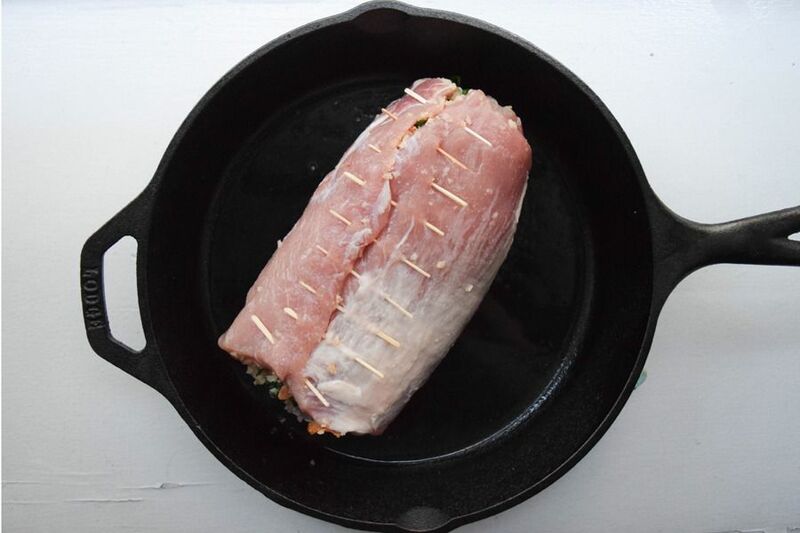 Place the pork between two pieces of plastic wrap and flatten the meat with a rolling pin to until it is an inch thick. 6. Remove the top layer of plastic and cover the pork with the stuffing.Working from left to right, roll the pork like a scroll. If the stuffing starts to ooze out just stuff it back in. 7. Secure the seams with the toothpicks. 8. Preheat your oven to 375° F.
9. Coat the bottom of the large skillet with canola oil. Heat over high heat. When the oil starts to glisten add the pork roast seam side up. 10. Brown the roast on all sides, about 4 minutes per side. Remove from burner and transfer the roast to the oven. Cook for 30-40 minutes until the pork reaches an internal temperature of 140° F.
11. 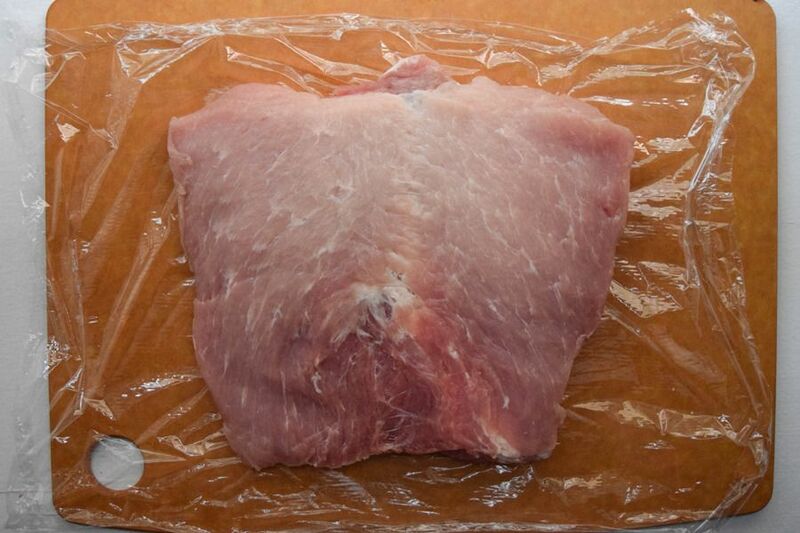 Remove the pork from the skillet and set aside on a wooden cutting board to rest. 12 To make the gravy, return the skillet to a burner over medium high heat. Add the butter and the flour. Cook, while whisking, until the butter and flour are combined and the mixture starts to bubble. 13. While whisking, add 1 cup of chicken stock to the butter and flour. Whisk until the stock is smooth Turn the heat up to high and bring the gravy to a boil. Reduce the heat to a simmer and cook while whisking until the gravy thickens slightly, about 5 minutes. Remove from heat and strain into a bowl. 14. To plate, cut the pork into slices that are about an inch in thickness. Arrange the slices on a plate or platter and spoon some gravy over the top. 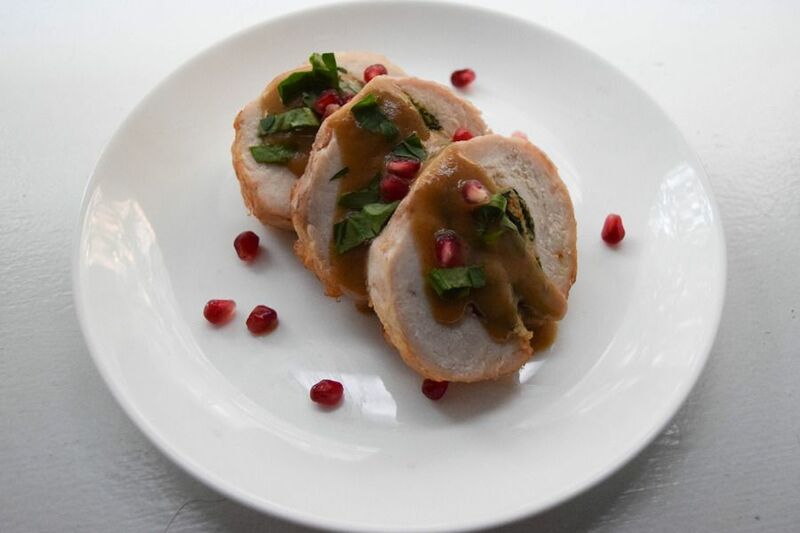 Sprinkle with parsley and pomegranate seeds.